Make your visit to the Colosseum truly memorable with this priority access guided tour of the most famous ampitheatre in the world! Immerse yourself in the history of this magnificent structure during this 90-minute tour with an expert guide regaling you with brutal details and facts about this architectural marvel! Afterwards, feel free to tour the Roman Forum and Palatine Hill on your own to round off your visit. Let your professional, English or French-speaking tour guide, depending on your choice, regale you with glorious tales from times gone by as he helps you navigate your way through the Colosseum over the course of 90 minutes. Enjoy priority access to the Roman Forum, the center of all political and social life in ancient Rome, as well as the Palatine Hill, from where you can take in unparalleled views of the capital city. This tour is limited to 25 people per tour group, making your visit that much more special and intimate. Please note that this tour is only available in English and French. Meet up with your guide, who will help you gain entry to the attraction. With over seven million visitors annually, the Colosseum is arguably one of the most popular tourist sites in the world. Believed to have been constructed as a gift from the ancient emperors to the Roman people, this grand outdoor amphitheater once served as the epicenter for entertainment, hosting various public spectacles and games. Your guide, of course, will be happy to answer your questions and tell you tales about the epic battles fought in the arena in ancient times. Your guide will also walk you along the entire circumference of the Colosseum. For 90 minutes, you get to travel back in time and understand what this amphitheater must have been like when it was occupied by 80,000 screaming Romans. Following your tour of the Colosseum, make you way to the Roman Forum, where you will gain priority access. Take in spectacular views of the Forum as you try to imagine what it must have been like during it's heyday and, afterward, walk past the most important and breathtaking monuments present here as you explore the area on your own. Feel free to then trek to the top of the Palatine Hill at your own pace for unparalleled views of the Forum and Circus Maximus, making it clear why this was once one of the most coveted neighbourhoods in Ancient Rome. 90-minute guided tour of the Colosseum. Expert, English or French speaking tour guide. Priority Access to the Roman Forum and Palatine Hill. You must carry a valid photo ID with you and present it at the time of entry if requested. If you choose an English Guide, you will have to meet your tour guide at 12:30 PM at the meeting point. If you choose a French Guide, you will have the option to select between 10:30 AM, 11:30 AM, and 12:30 PM, and you will have to meet your guide at the respective time at the meeting point. Your visit begins at The Roman Empire Travel Agency, located at Via Capo d'Africa, 15A, a 4 minute from the Colosseum. The staff will assist you and accompany you to the entrance of the monument. If you’re coming from Rome’s Termini train station, the quickest and most efficient way to reach the Colosseum is by metro. Via Capo d'Africa, 15/a. 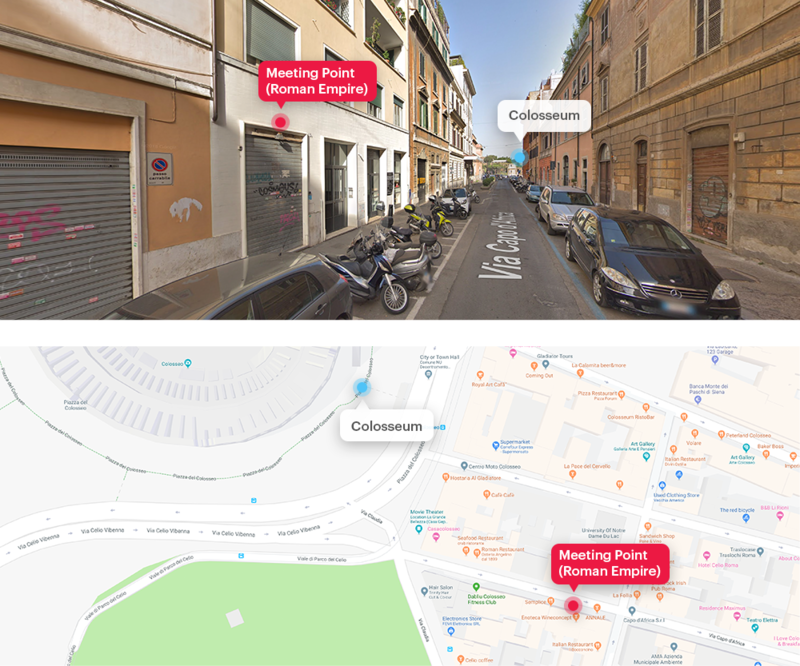 The closest Roma Metro stop is Colosseo (metro B) and is a 6-minute walk via Piazza del Colosseo. Trams 3/8 (Piazza del Colosseo) lead directly to the Colosseo/Salvi N. stop, which is a 2-minute walk to the Roman Empire Travel Agency. The Colosseum is a 3-minute walk from the Roman Empire Travel Agency. For safety and security reasons, no large backpacks or pieces of luggage are allowed inside the Colosseum. No storage facility is available. You can, however, take a baby stroller into the Colosseum with you, should it be necessary. The place has this aura that cannot be described, you just have to experience it. Must visit in Rome! Be sure which levels of Colosseum you want to see. I feel this tour covers everything and is just right for normal tourists. We started late, some of the group members got late and then they didn't check in their bags properly. Your mobile ticket will be sent to you shortly. Please display this on your mobile device at the meeting point to your tour guide before the tour commences.